Henry V (9 August 1387 – 31 August 1422) wis Keeng o Ingland frae 1413 till his daith at the age o 35 in 1422. ↑ 1.0 1.1 1.2 Allmand, Christopher (September 2010). 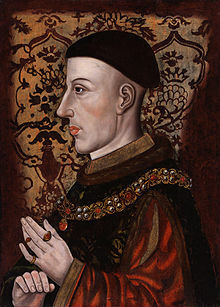 "Henry V (1386–1422)". Oxford Dictionary of National Biography. Oxford, England, UK: Oxford University Press. doi:10.1093/ref:odnb/12952. ↑ Henry V (biography), Archontology, retrieved 28 November 2009 .